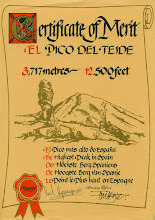 www.HoffySwims.com: This week - The biggest swim of my life so far! This week - The biggest swim of my life so far! This past week I have had a relaxing taper down week, to rest my body for what will undoubtebly be the biggest swim I have ever competed in. 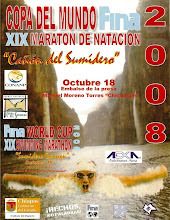 It is the FINA Open Water Grand Prix Sabac Swim Marathon 2008, which will be hosted in the town of Sabac in Serbia. 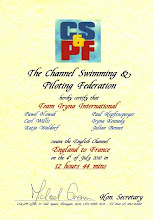 I will be swimming against none other than the English Channel World Record Holder Petar Stoychev. He is the number 1 seed, and I am listed as No. 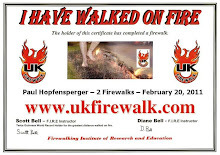 21 of 26, and I am also the second oldest in the competition. I will report back after the swim, but I will be doing some light training this week in the pool and in the river Sava in Serbia. Please tell me of your experiences, so I can post at www.10Kswimmer.com and www.10Kswim.com. 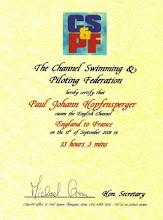 Also, please send any photographs so I can help promote your open water swimming experiences. Good luck! Hi steven. 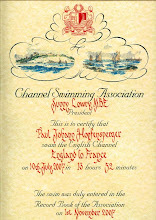 Thanks for your comment and I suppose a very belated congratulations for all of your magnificent swimming successes over the years. 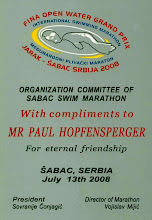 Please e-mail me a paul@hoffyswims.com so I have your contact details, and I will e-mail you some photos from Serbia. Best Of Luck. Hope it goes well. Enda - Thanks mate. Hope everything is going well, and look forward to seeing you in Dover in a couple of weeks.